Brightleaf Square occupies the former Watts and Yuille tobacco warehouses, named for George W. Watts and Thomas B. Yuille. The warehouses were built between 1900 and 1904 as part of an aggressive building campaign by the American Tobacco Company for storing, aging, and fermenting tobacco for cigarette manufacture. The twin brick structures punctuated the Durham skyline and announced the company’s new, bold corporate image, which reflected the fair of its founder, the entrepreneur Washington Duke. 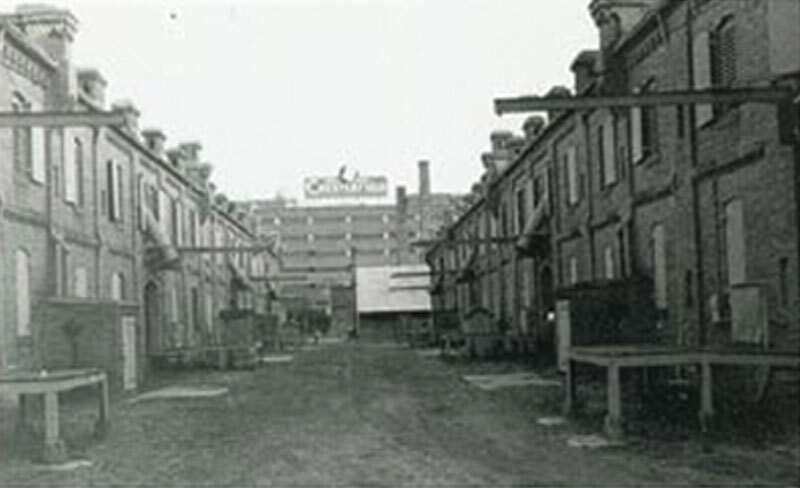 Furthermore, the warehouses stood as economic and cultural symbols of the growing importance of cigarette smoking and the industrial revolution’s impact on turn-of-the-century America. The architecture of the warehouses advertised the company’s status and reflected its specific functional requirements. The parallel brick buildings with an interior courtyard feature such intricate exterior detail as stringcourses, dentils, pilasters, and elaborate chimneys on the parapet walls of the firewalls. The decorative program precisely articulates the interior subdivisions. Each building is seven bays wide and twenty bays long; the bays are divided by pilasters on the exterior. The interior of the warehouses was done in post-and-beam construction using two local materials, brick and heart pine timber. Each unit was a large open space 75 feet by 118 feet, with four units totaling 35,400 square feet on each floor, broken only by rows of thick octagonal columns, designed for easy loading, unloading, and ventilating of tobacco leaves. Ten of the seventy-two vents were used as vents; the rest are purely decorative. It has not been possible to assign the warehouses’ design to a single architect. Colonel William Jackson Hicks of Raleigh, North Carolina, in an 1897 letter to Benjamin Duke, discussed the practical requirements of the Walker Warehouse he was to build in the area. It is believed he was responsible for the initial planning of the warehouses, and that Albert F Hunt of Richmond, Virginia, perfected the plans. Local traditional supports Samuel Linton Leary of Philadelphia, Pennsylvania, who was an active designer in Durham in the 1890s as the architect for these warehouses. In 1911, the Supreme Court divided the American Tobacco Company into three smaller companies because of its violation of the Sherman Anti-Trust Act. The warehouses were subsequently bought by Liggett & Myers Tobacco Company, which used them for their original function until 1970. The warehouses were then put up for sale. In 1980, private developers the SEHED Development Corporation purchased the buildings. Construction began in the spring, and Brightleaf Square opened in November 1981. Its name was taken from a type of flue-cured local tobacco. SEHED engaged Walters, Ferebee and Associated of Charlotte, North Carolina, to adapt these buildings; the project architect was G. Edwin Belk.Brightleaf Square was designed to house retail and a restaurant on it’s the first floors and office space on the second floors of both the North and South buildings. The courtyard has been completely redesigned and landscaped, providing a strong visual link between the two buildings without giving the feeling of insularity common to enclosed suburban malls. Throughout the 1980s and 1990’s Brightleaf Square housed some of the regions most noted and acclaimed restaurants and retailers and has been at the forefront of a revitalized downtown Durham. In addition to the two warehouses, Brightleaf Square manages many restaurants on Main Street, forming an attractive district for dining and shopping. In 2004, Brightleaf Square embarked on an incredible transformation of the courtyard and made significant improvements to the North and South Buildings to promote better traffic flow. Restaurants and Retailers now face the courtyard providing visitors easy entrance and the ability to window shop while strolling between the buildings. 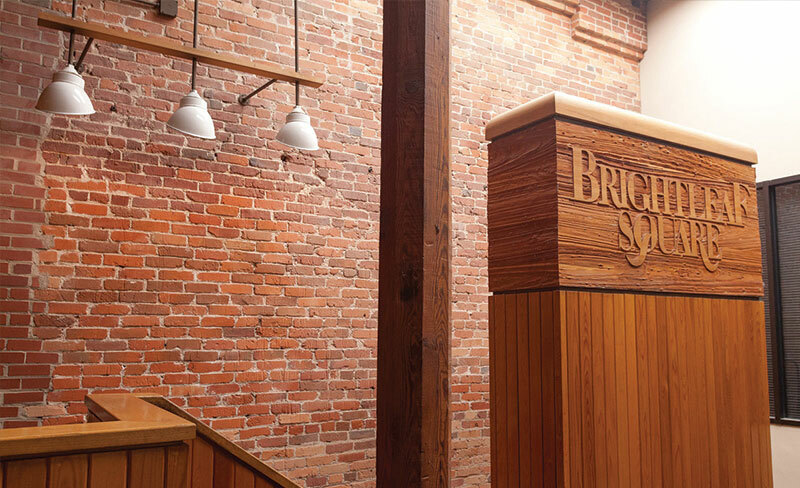 The renovations were completed in Fall 2004 and Brightleaf Square has welcomed several new tenants in addition to the businesses who have flourished in the district for many years. **Portions of the above history are taken from Remaking America ©1986 by Barbalee Diamonstein and Published by Crown Publishers, Inc.